At Cure JM, we’ve it easy for you to support children with JM while you enjoy the convenience of online shopping. Show your support for Cure JM Foundation with Cure JM-branded T-Shirts, hoodies, baseball caps, cell phone cases, mugs, totes and more. 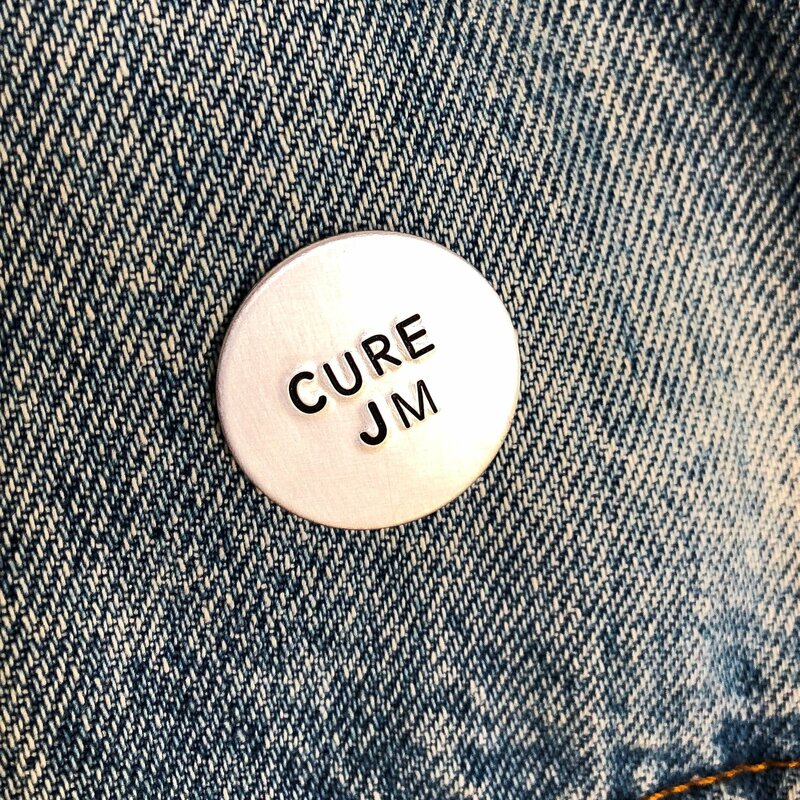 You’ll be helping to spread the word about Cure JM, and a portion of your purchase will go directly to to help fund Juvenile Myositis research. Click here to shop. AmazonSmile is a website operated by Amazon that lets you enjoy the same wide selection of products, low prices, and convenience that you currently find on Amazon.com. The difference is that when you shop on AmazonSmile, the AmazonSmile Foundation will donate 0.5% of the price of eligible purchases to the charitable organizations selected by customers. Simply go to smile.amazon.com, login with your usual Amazon.com login, and select Cure JM as the charity you support. Wear your support on your sleeve! 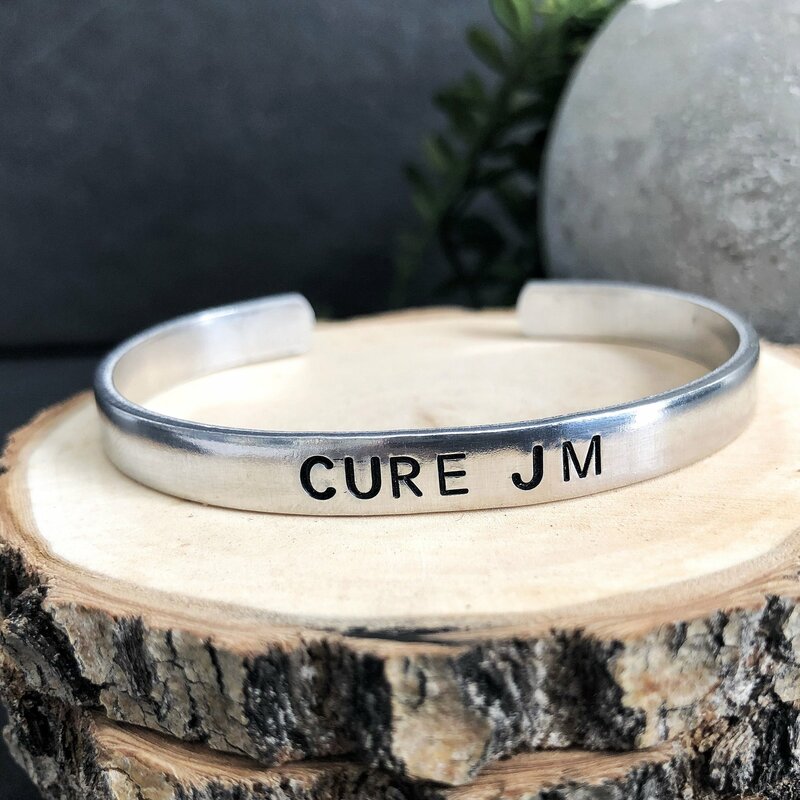 Cure JM wristbands are an easy, affordable and fun way to show your or a loved one’s support for Cure JM Foundation, and they’re a great way to start a conversation about Juvenile Myositis. Wristbands are available in black, white and rainbow colors in kids, adult and extra large sizes. What time is it? It's time to find a Cure for JM! 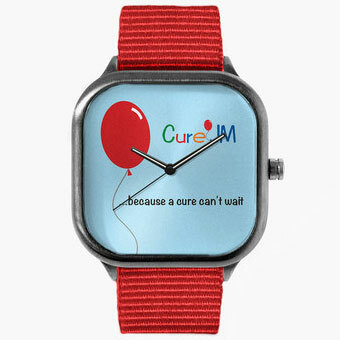 These Cure JM watches are great conversation starters and can help you spread the word about Juvenile Myositis and Cure JM Foundation. These quality watches offer stainless steel backs, Japanese Quartz Movement and 5 ATM Water Resistance, making them durable as well as fashionable. And with a variety of colors and styles you're sure to find one that suits your own personal taste. Plus, a portion of every sale goes to Cure JM Foundation, so you can help fund research while making a fashion statement. Click here to order one now. These ¼" wide bracelets are hand-crafted from high quality aluminum. Because each piece is handmade, you’re likely to see slight variations in the depth and spacing of the letters. meaning that your bracelet will truly be one-of-a-kind! The lightweight aluminum is both sleek and flexible, so it will fit a wide range of wrist sizes. Just give it a gentle squeeze to find your perfect fit. And with 25% of all sales going to Cure JM Foundation, you’ll be helping to find better treatments and a cure for Juvenile Myositis, while raising awareness of JM and Cure JM. Handmade from high quality aluminum, these pins measures 1 inch in diameter. They’re the perfect size to show your support on the lapel of your suit. But don't stop there. A tie tack pin and clasp on back lets you securely attach these pins to just about any fabric or article of clothing: Hats, jackets, scarves... even backpacks. And with 25% of all sales going to Cure JM Foundation, you’ll be helping to find better treatments and a cure for Juvenile Myositis, while raising awareness of JM and Cure JM. Whether you're booking travel or buying gifts, Goodshop is another easy way to support Cure JM Foundation. From Expedia and Hotels.com, to Barnes & Noble and Bass Pro Shop, Goodshop is your portal to over 2800 online businesses. Simply go to the Goodshop website, select Cure JM as your cause, click on the online store of your choice and a percentage of every purchase you make will be donated to . To get started go to www.goodsearch.com/goodshop.aspx. Looking for more online shopping options? iGive.com has teamed up with over 1300 online stores, including holiday favorites such as BestBuy, ToysRUs, Bed, Bath & Beyond and Lowes. Best of all, every time you make a purchase from one of these stores through their link on iGive, Cure JM receives a donation of up to 26% of the total purchase price. An extra $5 is donated to Cure JM for each registrant who shops at iGive within 45 days after signing up. To get started, go to www.igive.com and register with Cure JM as your charity. Then, just make certain that anytime you make an online purchase from one of the 1300+ participating businesses, you make the purchase using their link on www.igive.com.